The 2003 Game - STACK ATTACK - is played on a 54-foot long by 24-foot wide playing field. A 2-foot high platform that is 4-feet wide by 12-feet long is located across the center of the field. The platform is accessable from each of its long sides by ramps that are 8 feet long. Two alliances of two teams each compete in each match. Each team consists of a human player, two driver/operators, and a coach. A match consists of a 10-second Human Player Period, a 15-second Autonomous Control Period, and a 1 minute and 45 second Remote Control Period. The object of the game is to acquire and stack plastic storage containers that are initially located on the platform or placed on the playing field by human players. Each alliance must place containers in a scoring zone on its own side of the field to score points. The total number of points earned depends on the count of containers located in each alliance�s scoring zone multiplied by the number of containers in their highest stack. Additional points are awarded for any robot that is positioned on the top of the platform at the end of the match. If a robot is inoperable and unable to compete in a match, in order for that team to obtain a score, at least one member of the team must be in the team�s driver station during the match. This team member may be the human player. At the start of each match, 29 containers will be stacked in 5 tiers in a line across the top of the platform. The 5th (top) tier will have 3 containers. The platform container stacks will be located approximately 3 inches apart and centered across the platform. Robots will initially be placed within the starting areas in the alleys at the sides of the platform/ramp structure. 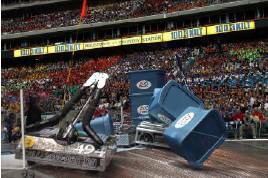 Each alliance�s robots will start on the far side of the midfield barrier. Each alliance will have 2 human players (1 from each team) positioned outside each of the two gates at their end of the playing field. Each human player will have 4 containers stacked near him or her. The remaining 2 players and a coach from each team must stand in their driver station. At a starting signal, all 4 human players will enter the field at the same time from separate gates at the sides of the field. They will have 10 seconds to place or stack their containers anywhere in their own Scoring Zone and exit the field. The human players will then stand on a pressure-sensitive mat located outside the playing field to positively indicate that they have cleared the field. Any team (not the alliance) whose human player is not off the playing field in 10 seconds will have their robots disabled during the 15-second autonomous period. Any team (not the alliance) whose human player is not off the field in 15 seconds will not be powered up and will not compete in that entire match. The autonomous operation period of the game will automatically start when the last human player leaves the field and all 4 pressure sensitive mats have been activated. The human players must then join their teams in the driver stations. As soon as the game starts, all robots will be under autonomous control (no human drivers) for a period of 15 seconds. During this time, the robots will operate and react only to sensor inputs and to commands programmed by their teams into the onboard robot control system. Operator control of the robot will not be possible during this time. The only operator control allowed during the autonomous robot control period is activating of the Emergency Stop (E-Stop) buttons located in the driver stations, which will disable that robot�s power supply. 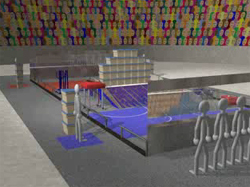 During the autonomous robot control period, robots may use onboard sensors to detect features of the playing field surface (e.g., the white lines or colored areas of the carpet), the containers placed in the scoring zones by the human players (which have detectable strips of retro-reflective tape on the sides of the containers), structural elements of the play field (e.g., using proximity or contact sensors to detect edges of the field or parts of the ramp structure) and/or other robots. During the autonomous robot control period, the robots may move about the field and perform any activities that would be normally permissible when operated under human control. All robot operation and safety rules applicable during the operator control period are also applicable during the autonomous robot Control period. Upon completion of the 15-second autonomous robot control period, the driver station controls will automatically be activated. Team members will remotely control and operate their robots for the remaining 1 minute and 45 seconds of the match. Power will be automatically shut off at the conclusion of this period. Robots try to acquire and stack (right-side up, upside down, on their side, etc.) as many containers as possible in their alliance�s scoring zone. The �gray carpet� alleys at the side of the platform/ramp structure and the �gray carpet� areas directly in front of each end of the playing field are �No Score� areas, i.e., not in the scoring zone. All containers within the alliance�s scoring zone will be worth one point each EXCEPT the containers in the tallest stack. The total number of one-point containers will determine the base score for the alliance. The tallest stack of containers within the scoring zone is the �multiplier stack.� Containers in the multiplier stack are worth zero points each (note that containers in other stacks of the same height are worth one point each). The total base score is then multiplied by the height in whole Stack Height Units (SHU) of the multiplier stack. A whole Stack Height Unit (15-1/4 inches) is the height of an individual container as it sits flat on its bottom. More than one stack of the same height does not affect the multiplier. Whole Stack Height Units will be measured with an Official Stack Height Measuring device. An additional 25 points will be awarded to each robot that is touching only the top of the platform at the end of the match. Both teams in the losing alliance get their own alliance score in Qualifying Points (QP�s). Both teams in the winning alliance get their own score plus twice the losing alliance�s score in QP's. A tie awards the total of the match points to both alliances in QP's. 33 Teams (.pdf, 8KB) attended the 2003 FIRST SBLPI LI Regional. 285 Teams (.doc, 507KB) attended the 2003 FIRST Championship. 787 Teams (.pdf, 141KB) participated in the 2003 FIRST Robotics Competition at 23 Regionals.